This deeply investigative article published in Walking with the Unicorn (2018) takes on some of the most exceptional facts about ancient Indus seals to surmise about their function in the Indus polity. The puzzling realities that an investigator must deal with include, one, that the seals themselves changed little for about 1,000 years, whereas other similar objects in Western Asia for example underwent rapid evolution. Secondly, in Frenez words, "the discovery at Indus Civilization sites of no more than two hundred clay sealings in total, versus the several thousand found at broadly coeval sites in the Near East suggests the existence of basic differences between the administrative sealing systems adopted in the two regions." Thirdly, in those sealings, the writing, not the icon, seems to have been most important. Fourthly, the "unicorn" (Frenez comes down firmly on the side of those who believe this is a mythical composite creature) completely dominates Indus seal motifs, accounting for an average of 65% of all seals across individual Indus sites, not just Harappa and Mohenjo-daro, and 70% of all seals. What to make of this? Frenez, like many good Indus archaeologists forced to deduce from multiple clues around some basic missing knowledge of the civilization's structure and language(s), manages to extract quite a lot. He offers that seals functioned much like business cards, as part of a marketing strategy that "features a limited and apparently consistent number of firms/brands with a low degree of personalization, which was apparently regulated proactively by strong cultural and legal prescriptions." Indeed, "the inscription seems to have played a central role in performing administrative sealing practices, while in this case the icon was not equally important or anyhow subordinate to the inscription. 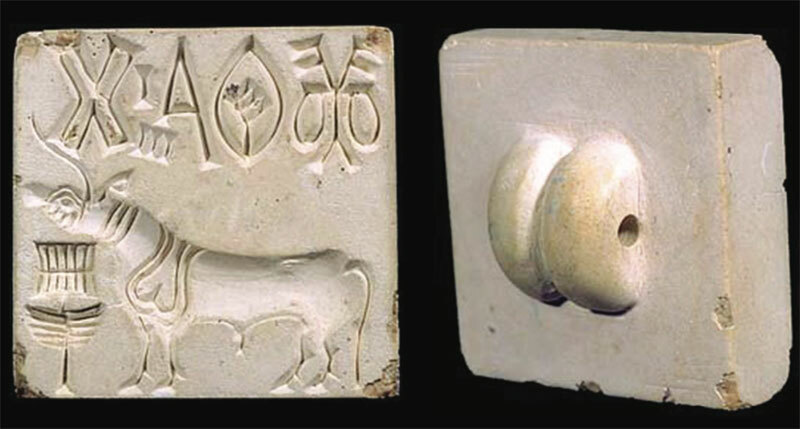 Accordingly, it is possible to imagine that the animals and the other images represented on the standard Indus seals probably had a function completely or partially separate from the inscription, likely related to the direct visual identification of the role of the seal user within specific socio-economic contexts" (Walking, p. 172). The unicorn seal evidence at least suggests a highly uniform, central authority or elite that ruled for a long time. Once it was over, the unicorn and its writing vanished. Another excellent, thought-provoking paper by a versatile Italian archaeologist, whose work is informed by earlier work he did with sealings at Lothal and the current excavations he is engaged in around Indus artifacts in Oman and the Gulf. Read Private Person or Public Persona?